The Kahoona is back for the 2015 season. This is one of Best’s most successful kite models, as it is designed to accommodate any rider and any style. It is a reliable all-round kite, perfect for casual rides who want to cruise and enjoy a smooth kitesurfing session, for intermediate riders who want to progress and even for advanced riders who want to have fun. It is a do-it-all kite. As the guys at Best say, the Kahoona is the perfect all-rounder kite for any skill and level. And they are right. The Kahoona packs solid power and ease of use into the same package. It is one of the most user friendly kites on the market, with awesome freeride potential. It features a Delta shape which ensures very quick relaunch, solid depower and accurate control. And it also makes the kite easy to ride in a wide wind range. A five strut design makes the kite very stable and prevents back-stall. It also keeps it crisp in the air and maximizes its low end. A new 2-point back bridle system improves control and relaunch. The Kahoona is very easy to control. It is also light and fast and can perform cool jumps and lifts with ease. The swept wingtips ensure maximum stability, high depower, huge low end and the easiest possible relaunch. The Kahoona is easy to fly and helps you progress fast. It is perfect for anyone. 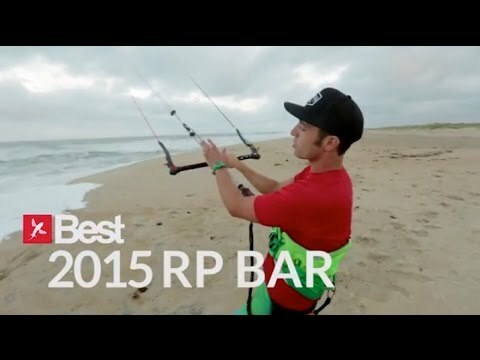 The RP Bar is one of the safest 4 line control systems on the market. It features a fully adjustable depower system for any rider and any riding style and a one handed emergency safety.